EFT, Emotional Freedom Techniques, is an easy yet effective method developed by Gary Craig that allows quick release of negative emotions. 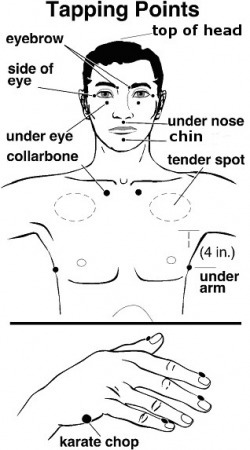 EFT involves tapping on or lightly massaging certain meridian points that communicate energetic information throughout the human body while you focus on the emotion you want to release. It is a true mind/body healing technique because it combines the physical effects of meridian treatments with the mental effects of focusing on the pain or problem at the same time. Physical pain, emotional issues such as fear, anxiety, depression, phobias, stress, guilt, sadness, trauma, addictions, issues of pregnancy and childbirth, issues of abuse, children's issues and symptoms of chronic, debilitating disease are the most common. However, EFT can be used on practically anything in your life that needs changing. Here are the basic steps so that you can try it on yourself. STEP 1 - Get Connected! : Think about someone or something that really makes you feel frustrated i.e. your hectic schedule, your health, your weight, lack of success, money issues, your job... maybe a co-worker or a spouse, child or other family member. Pick something that has been on your mind a lot or upsetting you lately. Focus on the frustration you have around this situation, event or person. Close your eyes and connect to or think about a related circumstance or event that will help you build the feelings. When you are fully connected or associated with it, locate any uncomfortable sensations or feelings in your body i.e. tightness in your stomach or chest, tense shoulders or neck, clenched jaw etc. STEP 2 - Get the 'STARTING INTENSITY' (0 - 10 scale) Example: On a scale of 0 - 10, I feel a frustration level of 8. ('10' is feeling extremely frustrated and '0' no frustration at all) Check with your ‘gut feeling’ not what’s in your head. Make a guess if you are not sure, it will work just as well. Now you can begin the tapping round... continue to step 3. STEP 3 - Say the ‘SET-UP’ statement (you'll learn it next) 3 times while you continually tap on the karate chop point KC (1). If you are right handed, use the tips of the pointer, middle and ringer fingers on your right hand and begin tapping lightly on the karate chop point KC (1) which is the soft fleshy part of your left hand - located between your wrist and pinky finger. At the same time as you tap on the KC (1) point with a constant beat (i.e. 1 tap/second or a bit faster)… say the following “set-up" statement 3 times. Important Note: Really feel and mean it when you say you accept yourself for having these feelings. STEP 4 - The ‘SEQUENCE’ During the Sequence (when we tap on the various body points), we use a 'reminder statement' that has only 2 of the words... "this frustration". Say this reminder statement ONCE as you gently and continuously tap with your finger tips on each of the body points (tap on points 2 to 9 in the diagram). You'll tap approximately five to seven times on each body point as you say "this frustration" one time at each body point location. Note: Use the body points on the right side if you are right handed and the left side points if you are left handed. For the under arm spot, reach over to the other side of the body i.e. right handed people will reach across to the under arm spot on their left side. Now... do the ‘SEQUENCE’ (see diagram for points):Top of head (TH) (2) "this frustration" - Eye Brow (EB) (3) "this frustration" - Side of Eye (SE) (4) "this frustration" - Under Eye (UE) (5) "this frustration" - Under Nose (UN) (6) "this frustration" - Chin (CH) (7) "this frustration" - Collar Bone (CB) (8) "this frustration" - Under Arm (UA) (9) "this frustration"
After you have finished the ‘SEQUENCE’ take a deep breath, gently stretch your neck and roll your shoulders. At this point many people yawn, a sigh or feel a 'shift'. To get the Ending Intensity of your first tapping round, focus back on the physical location where you felt the frustration i.e. in your stomach or neck and get the intensity of the feeling now (example: if it was an '8' it may be down to a '4' i.e. it's half as tense or tight as it was when you began tapping). Do not be concerned about being exact about coming up with a number... this is not important. Just go with your best guess or take the first answer that comes to you. You will get better at doing this, as your EFT skills develop over time. The fact that you can do the Emotional Freedom Technique on yourself anywhere, everywhere - all it takes is a few minutes and your own hands - makes EFT remarkable in all ways in psychology and self help. It was designed for ease of use so that everyone can benefit from using the techniques without prior knowledge about meridians. Without any training, you really can use EFT to help yourself in moments of doubt and fear, in the middle of the night, or when you are on your own. This technique is clinically proven effective with a success rate of 80% or better. You have nothing to lose by trying it. It is gentle, non-invasive, private, and you are in control at all times. I have used EFT on myself as well as family members and clients for several years. It truly is an easy to learn technique that can produce immediate results. Your results will depend on how long you have had the issue you are trying to resolve and how willing you are to change. .